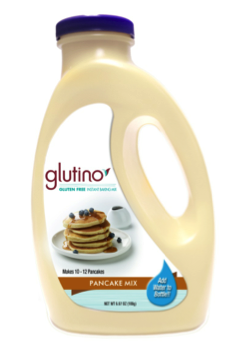 Glutino Launches Gluten-Free Instant Pancake Mix – just add water! Home \ CeliacCorner Posts/Blogs \ CeliacCorner Blogs \ Glutino Launches Gluten-Free Instant Pancake Mix - just add water! Glutino recently announced its first-ever gluten-free instant Pancake Mix. The instant mix comes in a portable bottle and only requires a cup of water. Once the bottle is open, it is good to use for up to four days (must be refrigerated). The pancakes cook in just a few minutes. INGREDIENTS: BROWN RICE FLOUR, WHITE RICE FLOUR, SKIM MILK POWDER, SAFFLOWER MIX (SAFLOWER OIL WITH TOCOPHEROLS, NONFAT MILK, DISODIUM PHOSPHATE, NATURAL FLAVOR), SUGAR, EGGS, BAKING POWDER (SODIUM ACID PYROPHOSPHATE, SODIUM BICARBONATE, CORN STARCH, MONOCALCIUM PHOSPHATE, CALCIUM SULFATE), SALT, XANTHAN GUM.